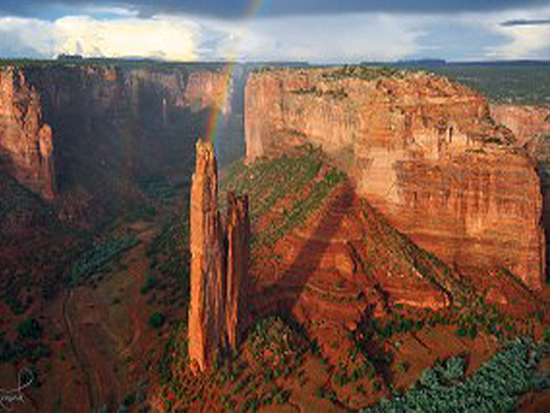 Spider Rock is one of the most awesome and sacred places in Canyon de Chelly, Arizona. Earth Walks will be there on the next journey, September 8-11, 2016 and there are only a few spaces available for those interested. On the second day of our journey, we will travel through the red sandstone canyons, past groves of green cottonwood trees and a trickling stream to Spider Rock where there will be time for solitude and meditative time at this place of awesome beauty. Spider Rock is the home of Spider Woman who is highly honored as a deity among the Dine. 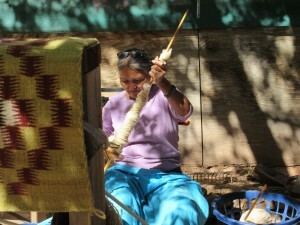 Some say she chose the top of Spider Rock as her home and is the teacher of weaving. On our final day in the canyon, Earth Walks will spend time helping with a variety of needs on the family farm of long time weaver Kathryn Pemala. Kathryn will share the practical and mystical meaning of weaving for the Dine. We will camp in the canyon on family land of our Dine guide who will lead a sweat lodge. The final evening, participants have the option of staying at the Sacred Canyon Lodge near the entrance of the canyon. Free camping is available adjacent to the Lodge. We depart on Sunday, September 11. Cost: $420 Includes guiding fees, meals while in the campground, sweatlodge preparation and materials, transportation in and out of the canyon. Deposit: $140 due August 8, 2016. After this date, deposit is nonrefundable due to obligations with guides and those making arrangements from out of New Mexico. Remainder of fee due August 22. Contact Earth Walks for registration and information. Only a few spaces available!